There are other frames like this – pitbull & Xperl are both popular choices. 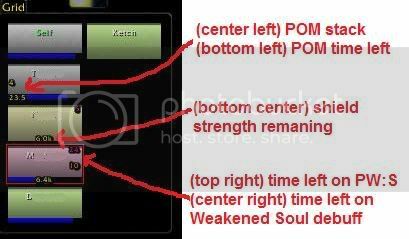 I find Xperl has too much “stuff” on it, and Pitbull’s setup I find a bit too “code-y” for my taste. So I use Ag for my target, focus, self, and pet (and target of target, target of focus). Close up of target and focus. The only downside is that Ag isn’t updated nearly as often as I’d like. I may end up switching to Pitbull. 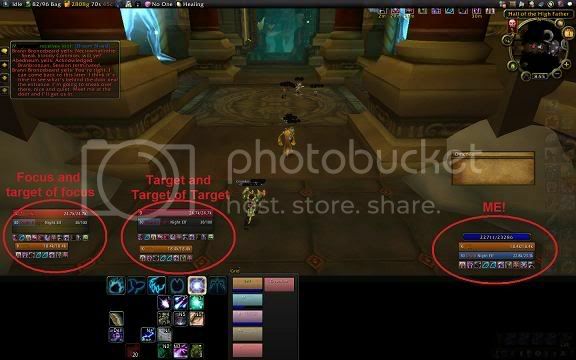 If you don’t use grid, healbot, or vuhdo, these frame programs have customizable group frames and raid frames. I test drove this a while ago and love it. This replacement for the overhead bars of mobs (or friendly players) allows you to see an improved casting bar plus threat status. The threat monitor is incredibly useful as caster DPS if you can see which mob is coming right for YOU (and not the suicidal mage next to you). The cast bar is far superior to the default and makes it very obvious which mob is casting something nasty. But things can get a little crazy with a lot of mobs. Alternatives are Healbot and Vuhdo. 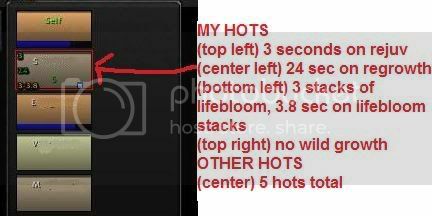 Both have built in click casting and there’s no need for clique. Here’s my Grid Setup. And below are some “Action shots”. I like being able to see my mana bar when I’m in forms, so I downloaded this addon. I’m sure other unitframe mods do this without an additional addon – but ag unit frames does not. There's also ShadowedUF [http://www.wowinterface.com/downloads/info13494-ShadowedUnitFrames.html] you could try, if you don't like PitBull. I switched to it from PitBull3, hoping it would be a bit easier to configure, and I found it to be very fitting for my needs.